The competitive dynamics of the current business scenario made organizations take stock of their current business processes. 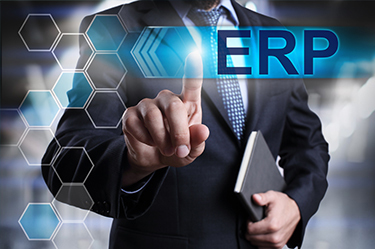 A glaring need for an Enterprise Resource Planning (ERP) system came to the fore. ERP is a financial management system that works at the backend of the business, and automates all important process. It optimizes resource output, profits and customer satisfaction. Therefore, many enterprises invested in ERP systems to give their businesses a technological edge, and improve business intelligence. However, according to research, 61% companies were unhappy with their ERP implementation, especially with the timelines. This is a significantly high number. Implementation is an important process that needs expert planning, designing and execution. This is a process where both parties, the buyer and the solution provider, are equally responsible. Many companies purchase their solution, implement it hastily and expect instant results. This is the reason why many ERP implementations fail. Merely adding technology to your business is not the solution. Time needs to be spent on proper planning of the whole implementation process. Implementation failure results in wastage of time and money. It may even completely create a negative opinion regarding the use of technology to empower businesses. ERP is a solution which mostly affects the work of your resources. Hence, they need to be a part of the implementation process. The right deployment will ensure success and provide scope to further empower business with technology. Here are steps you can follow to ensure the successful implementation of an ERP solution. Initiate by Getting Organized - Each company is different, so will be its requirement from the ERP system. The first step is to assess true business requirements. This will give you a clear idea of the procedure ahead. Know your Solution Provider - Once a solution and its provider have been finalized, companies need to understand the process or methodology they follow during implementation. This will prepare you and your internal resources for deployment. It will give you a clear picture of the expected timeline, and the level of dedication required by your resources. You can also research on the reputation of the product and solution provider. Also, pick a person in-charge of the whole implementation procedure. This project manager needs to be well-updated on your internal processes, and your expectations from ERP. They need to be hands-on throughout the implementation, and provide guidance to your resources and solution provider. Set Expectations - Creating a project management team that reports to the project implementation manager is another important step. The team needs to be given a thorough brief regarding ERP implementation. They will need timely guidance and will be deeply involved in the whole process. Their dedicated towards involvement will ensure timelines are met. A change in the business processes is daunting task. Therefore, the people who will mostly be affected by the change – the employees - need to be involved. Analyze your Needs - Your team and project manager should analyze your needs from ERP. However, they can end up with a wish list that is not feasible. They need to fully understand what processes, old and new, will actually add value to your company's functioning. There'll be many processes that'll need modifications, and your team will be the right people to guide the solution provider regarding the modifications. They should develop a work plan and adhere to it. Customize your ERP - Following the set plan will ensure this process is simple and executed without any glitches. The project management team can create workflows, configure the customized ERP system according to specific needs, and migrate all the important data. ERP Training is another important part of the whole process. An ERP affects the work of every single employee. Training is the key. Most implementations fail because the employees are not comfortable using the system. Therefore, the project management team, along with the solution provider, can plan out a set module to train the employees. This module can be used to train future employees as well. Optimize - Optimizing your ERP's performance is a continuous process. Business needs evolve over time, so will yours needs from the system. In the future, you will to add more applications or modules to your system that will further benefit your business. You may also further add supportive systems like Customer Relationship Management (CRM). These systems integrate well with Cloud ERP systems. The best ERP solutions in the world can fail if they are not implemented properly. Successful implementation is the responsibility of the solution buyer and provider. Precise planning, well-defined roles, training, and execution will ensure a successful deployment.